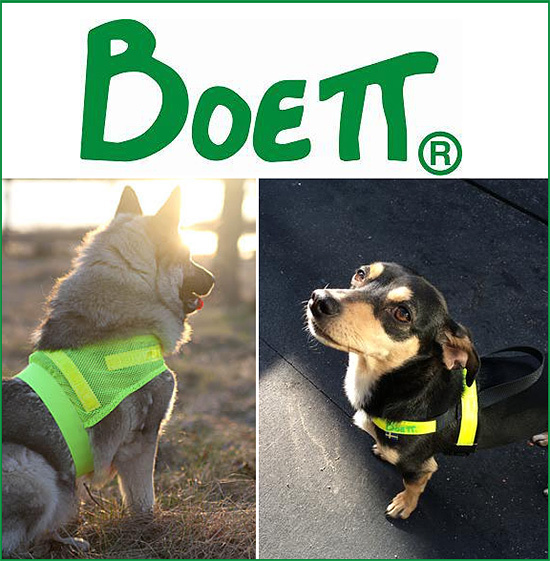 Make sure you and your dog are safe when you walk in the dark with Boett reflective products! Boett is a Swedish company and brand that has been in business for over 20 years now. Founded by Lisbeth Sundberg, who runs the Swedish office. Boett is a family business and we are very concerned with the wellbeing of animals, we frequently donate products and funds to animal related charity organizations worldwide. Reflective Harness: An elastic harness that allows full movement for the dog. Slips over the head and then closes around the body with a buckle. Three color options for the elastic band: pink, orange and yellow. It is available in two widths -1” for smaller dogs and 2” for medium and big dogs. In total there are 12 sizes. Reflective Track Harness: A nylon harness with reflective strips, a sturdy loop with a welded leash ring allows you to attach your leash and hold on to your dog in low light situations. It is available in two widths -1” for smaller dogs and 2” for medium and big dogs. In total there are 12 sizes. Reflective Collar Velcro: A reflective collar, Velcro closure. No leash ring, this product is for visibility purposes only. Reflective Vest: Yellow reflective strips on a thin yellow mesh. The vest closes around the body with an elastic strap and a buckle. Ideal for farm dogs who aren't supervised and run off leash. Reflective Leash Extender: Available in three sizes, this product works as an extension between the collar/harness and leash. Attach the leash in the welded D-ring and the other end, with the hook, to your leash ring. Your leash now has a reflective part that sits close to the dog. What Do Customers Say About Boett Reflective Gear For Dogs? I just got it yesterday so we tried it out last night and it has a really strong hold. I like the extender too, easy to get on and off of the collar and it's very durable! What a great idea. I worked the other night and we put some reflective collars on the dogs. It is perfect on the dark road we have to walk the dogs on. I love the reflective harness I got for Coco, perfect for night walks in the city as well as our trips to the country. Great product! Order Boett Reflective Gear For You and Your Dog Today! Be sure to keep both you and your dogs safe when walking past sunset! Boett Reflective Wear for dogs is easy to use and can be seen for quite a distance. It is worth the effort to keep you and your dogs safe! For more information about Boett reflective gear and to place your order, please call us today... or find us at Amazon!